Forgive us if, for being unlearned, untutored, uneducated, untrained, unschooled, unlettered and unsophisticated bigots (or else, supine and close – minded fawns). Forget that some of us saw the introduction of the “compulsory” fee – free education in the 1960s backed by the Education Act, 1961 which saw the upsurge of enrolments that necessitated the running of the “shift – system”. Fortunately, for the feminine categories, that was the first time Ghanaians fully appreciated girl – child education, instead of the earlier belief that a ‘woman’s place is the kitchen” and that whatever level of feminine education, the women would end up going into marriage. Disregard the fact that but for the Accelerated Development plan of Education of the government of the 1950s and 1960s, some of us could not have been engaged as pupil – teachers, leading to our training as certificate ‘A’ teachers and then on and on and on; go ask Professor Ansu Kyeremeh, and ask Professor Boafo Arthur. Discount the point that some of us have routinely followed education in the country and gleaned appreciable facts from there. But, having said all that, please, don’t dismiss us as ignoramuses, nit – wits or nincompoops – just let us speak our minds. We have cognited upon the history of education in Ghana: the Castle schools that promoted the likes of Jacobus Capitein, Anthony William Amo, Philip Quaye. The 3Rs Reading , Writing, Arithmetic, the reforms by Guggisberg leading to the establishment of Akropong Training College (1848), Abetifi (1898), Aburi (1930), Agogo (1931), Mawuli (1950) Prempeh College (1949) cognited upon the Government’s participation in education: from 1850 onwards: Governor Rowe, Governor Griffiths, Governor Rogers,’ and Governor Guggisberg. What is the double – track system? And what led to it? 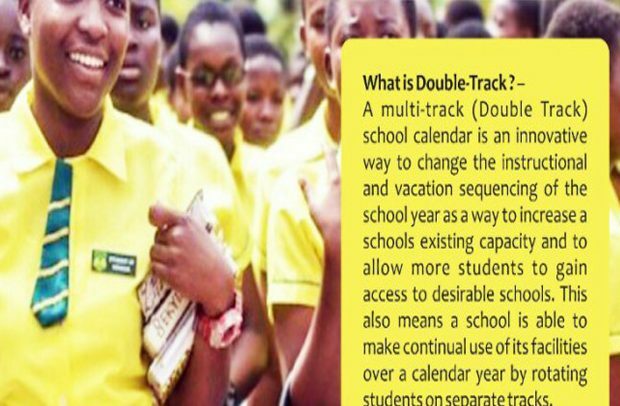 The double track system is premised on the fact that the double year round system splits the entire student body and staff into two (2) different tracks; so that while one track is in school, the other is on vacation. There is a distinction between the double – track system and the shift – system: in the former, the semester system becomes fully operational, with one batch going to school in one semester; another batch attends classes in another semester. With the same facilities and under the same staff. In the latter, the day is divided into two: morning and afternoon. While some students go to school in the morning, others go in the afternoon. Of course, the ideal situation would have been – get the students in school at the same time. But what did the NPP government promise Ghanaians: Free SHS. And it came to pass. So, now everybody wants to take advantage of the free – ness in education. Parents who had never dreamt of sending their children to school are now desperately preparing them for school. What do you expect to happen? The enrolment figures will definitely shoot up. So, we have to devise a strategy to tackle the problem. The answer the government found was the ‘double – track system! NAGRAT President, Angel Carbonu would want “Prof Anamuah and his team (to) start a stakeholder discussion on this issue”. That’s a valid point. According to the Deputy Minister of Education, Dr Yaw Osei Adutwum, “Ghana is not the first country to go double – track; it is practiced around the world… you have an opportunity to enroll more students in your top performing schools and at the same time increase contact hours for them. You have an opportunity to decongest the existing schools by employing a time – tested double track system…. When you are embarking on a major infrastructural development and you are not there yet, it’s a stop – gap measure….” What some of us are happy about is that Dr Adutwum says the government is ready to accept inputs and criticisms to make the programme a success. That is where people with fresh ideas have to fit in instead of taking undue advantage while the children suffer. With the whole conundrum taken as NPP – NDC debacle. Okudzeto Ablakwa MP for North Tongu condemns NPP for poor planning which has led to this: “… the government has been forced to introduce the double – track system as a result of poor planning and lack of foresight. This system will affect quality of education and will put pressure on facilities in various schools”. You see, the NDC still has strong faith in “progressively free SHS programme mantra. NDC can never forgive NPP for insisting “We must find a way to ensure that all children go to school. Poverty should not be a hindrance at all. That is why the free SHS policy is still a priority for the NPP. Every child must be given the opportunity to go to school”. That was Nana Addo speaking at James Town during the heady campaign times. President Akufo Addo repeats the Chinese adage which says: “A journey of a thousand miles begins with a (single) first step.” Kwaku Asante Bismark writes to the President and recalls: “I was sacked from class and the exam hall a couple of times because I owed school fees, so yes, I know how it feels and I am in support of the programme (free SHS)…”. However Asante thinks: “… we cannot afford free SHS on its current system…” who are we to say this is a contradiction in terms. Who will constitute the “progressively free” batch of students: certainly not our sons and daughters. The Akropong College of Education motto is “That all may be one”. Can we ever be one? With all these punches?